Not as good as some of the previous Black Friday deals but effectively £139.99 if you need anything else from Argos with the £10 voucher. I'd want a full phone for that! This website is Hot UK Deals and this IS a deal. 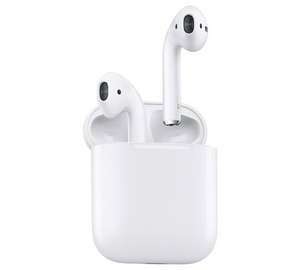 If YOU wouldn’t pay £150 for a pair of Airpods, that’s your prerogative, but that doesn’t mean it’s a cold deal. It’s a really moronic way of voting and means those who are looking for deals on Apple products will never or at least rarely see them, because you morons downvote any price drop just because YOU wouldn’t pay the price. It really frustrates me and disappoints me. It’s without doubt the biggest downside to this service. Thanks ive been looking around for a deal for these, just missed out on the Black Friday deals, so i'll keep this in mind. I wish I could afford £150 for a set of earphones. Serious question what makes them so special? I wish I could afford £150 for a set of earphones. Serious question what …I wish I could afford £150 for a set of earphones. Serious question what makes them so special? The same thing that makes your comment boring and trolling. Cos it’s just what it is. Sorry, but did you hand-craft these yourself? No? Then maybe you need to grow up and stop getting upset because someone voted cold on a deal and doesn't agree with you. The hypocrisy and irony in your own post is amazing. Troll much? Sad person that you have to write stupid comments on threads. …Troll much? Sad person that you have to write stupid comments on threads. Your poor sad and boring miserable old life that you live. What’s the matter your fat smelly wife not give you much?? I think people will pay this much for headphones but it's usually for ones where sound and fidelity is more important than having the latest product - having used these, the sound quality is very average and while pairing is easy, I can't say I need to pair my headphones more than a few times a year (?) and then there's the thing with them falling out easily. Am happy to admit I bought an iPhone X and like it, but definitely passing on these. I know, right! Is that some serious pent-up rage or what! It is a good deal, the people that vote this cold have the cheapest car, the cheapest bed, cheapest TV etc etc and the cheapest earphones. Just comparing them to normal earphones isa floored argument straight away, your comparing your Nans Ford Fiesta to a Tesla. These are the first and still currently best truly wireless earphones. Being on the edge of technology comes with a price. No they don’t sound like a pair of higher end Sennheiser Headphones, thank god we have genius’ around to bless us with such knowledge. You carry on with that watch you got out of a cracker while others have a Rolex and preach how yours does the same thing for cheaper, dead argument. The same thing that makes your comment boring and trolling. Cos it’s just w …The same thing that makes your comment boring and trolling. Cos it’s just what it is. Don't get your knickers in a knot. There seems to be a lot of rage in this thread. May I ask why everyone is so angry over a pair of earphones??? I think there may be a touch of jealousy around here..... excellent headphones *that is all*! Sorry, but did you hand-craft these yourself? No? Then maybe you need to …Sorry, but did you hand-craft these yourself? No? Then maybe you need to grow up and stop getting upset because someone voted cold on a deal and doesn't agree with you. The hypocrisy and irony in your own post is amazing. It isn’t me they’re disagreeing with. It’s the deviation from rrp. I think you need to look up hypocrisy and irony, too. The comment up from here regarding dumb down voting hiding deals sums it up more succinctly than I could. * I use headphones at the gym everyday/listening to podcasts around town and these are simple to store and set up. * I know they will fit perfectly and are comfortable as they are the same as the ones that came with my phone. * I care about audio quality but I'm willing to make a sacrifice because of the form factor and simplicity. * Battery is great and charges in the case, case charges with the same charger as my phone. * Pause music just by removing one from your ear. * Case keeps them well protected when in a pocket. * Simple to put in your ears, no cable to wrap around the top of your ear or tip to push in to your ear canal. * Price is on par with other wireless options but offers more tech. * Price is high but for truly wireless earphones of the same quality and reliability it's comparable across all manufacturers. Thanks for burying it with all the cold votes kids. I was just about to purchase 2 pairs at full RRP so many Thanks I …I was just about to purchase 2 pairs at full RRP so many Thanks I think there may be a touch of jealousy around here..... excellent headphones *that is all*! 'Jealousy?'.... wahahahahahahaha....... Apple products do not encourage jealousy.....pity maybe, but not jealousy . Deal posting newbie! This is one_chunk first deal post. Help out by leaving a posting tip or just to show your appreciation for their contribution.